The mother of all debates in Manchester is always about ‘green space’. It’s become an obsession of citizens particularly in the city centre as the row over Piccadilly Gardens proves. But in 1896, a mere two miles from the Town Hall, the city came within a hair’s breadth of gaining far and away the biggest municipal park in Europe and one of the biggest on the planet. 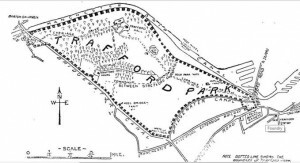 Trafford Hall and Park was 1,200 acres (Heaton Park in the north of the city is 650 acres, London’s Hyde Park is 350 acres and Central Park in New York is 843 acres). In 1896 Trafford Hall and Park’s owner Sir Humphrey de Trafford was fed up with being surrounded. In the late eighteenth century the Bridgewater Canal had swept along the southern boundary and through part of the deer park. In 1894 Manchester Ship Canal had opened and defined the northern boundary. Both works had been opposed by the de Trafford’s but on both occasions acts of Parliament had trampled over their objections. The de Traffords were one of the oldest families in England with one of the longest residences. They had been present in this area of Lancashire for more than 900 years, from before the Norman Conquest. That didn’t prevent the 3rd Baronet of the family getting edgy at the encroachment of factories, pollution and terraced houses. He was particularly concerned about the prospect of a large and busy port on his north eastern flank. So he offered the park to Manchester Corporation for £300,000. If the park had been acquired by Manchester it would have come complete with an eighteenth century stately home packed with art fronting an Elizabethan mansion of great charm. There would have been formal gardens, a boating lake and a tree-lined avenue four miles long through the deer park. There was even a sunken rose garden which would no doubt have pleased the present-day Piccadilly Gardens’ nostalgia hunters. 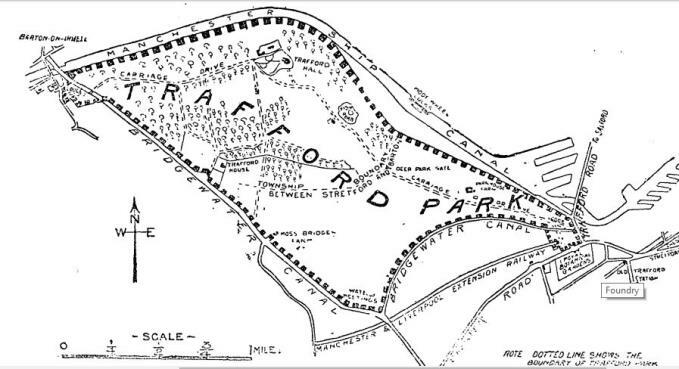 The magazine, Manchester Faces and Places, described Trafford Park in 1896 thus. ‘Entering from Chester Road the visitor walks through the outer park land consisting of meadows and fertile pastures into the great park and ultimately the Hall, the road being bordered on each side by trees which form an avenue nearly four miles long to the Barton gate. The scenery is pleasantly diversified by slight undulations, knolls and tree clad slopes, the beeches being fine specimens of their kind. ‘The Hall which occupies a good position on an elevation is a spacious structure with an imposing front divided by columns. Attached to it is the old Hall, a picturesque building, said to have been erected in the reign of Elizabeth I on the site previously occupied by Wiggleswick Hall. ‘The extensive gardens adjoining the hall are beautifully laid out and contain some fine and rare plants. The park also contains several small sheets of water one being known as ‘the Lake’ which is almost oval in shape, about an eighth of a mile long with a boathouse on the western side and a well wooded little island in the centre.’ The artworks in the house included Jan Breughel’s Four Elements. This is pictured below. The scene behind the charming ladies might be Trafford Hall and Park before industry crashed upon the scene. The problem was Manchester Corporation had just spent a fortune in ensuring the Ship Canal got finished and they were worried about increasing the burden on their rate-payers. So they had a word with the local authorities that actually bordered the park, Salford, Eccles and Stretford. Salford refused straight away to get involved. Representatives of Eccles and Stretford were hopeful they would be able to join with Manchester but council and committee meetings weren’t due for a couple of weeks. While the local authorities dithered Sir Humphrey acted. He sold the whole park area to Ernest Hooley and his syndicate for £360,000. 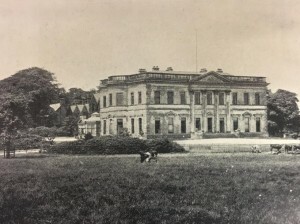 Shortly after the sale Ernest Hooley, who’d been planning to build big houses within the park and retain some of its character, met with the general manager of the Ship Canal Company, Marshall Stevens. The potential of exploiting the deer park for industry, facing as it did the new Port of Manchester, was too much. Marshall Stevens became the managing director of Trafford Park Estates and the fate of the area was sealed. When the news of the sale broke, Richard Pankhurst, husband of Emmeline Pankhurst, wrote to the Manchester Guardian with smoke coming out of his ears. He, along with many others, blamed Manchester Corporation. This, as we have seen, was perhaps a tad unfair. As often with bureaucracies Manchester, Eccles and Stretford weren’t fleet of foot. If it could be argued they’d procrastinated, Sir Humphrey maybe was hasty and didn’t give them chance to come to a mutually beneficial arrangement. ‘Sir,’ Pankhurst wrote, ‘a grievous calamity has descended upon us. One of the greatest opportunities of the city has been sold to a syndicate. The purchase by Manchester Corporation of Trafford Park would besides incalculable gains of public health and happiness, have proved at once a powerful aid to the prosperity of the ship canal and a most valuable covering security for the millions lent by the Corporation. The Corporation ought to have acquired and could have acquired the Park. The citizens do, and must, feel the greatest indignation.’ That afterwards Manchester regretted the hesitation is clear. Just six years later when the Earl of Wilton’s hall and park – Heaton Park – became available, the city moved quickly. The loud popular and civic clamour meant the council had little choice about stumping up the required £231,050. The deputy Town Clark, T Hudson, spoke about the need “to avoid missing the opportunity that had been presented with Trafford Park on this second occasion”. So while Manchester missed out on Trafford Park it gained Heaton Park instead. A lesson had been learnt. Still having such a deer park as Trafford Park so close to the city centre in 2016 would no doubt have boosted the ‘health and happiness’ of the area. Imagine in these post industrial days how the park with the Ship Canal might have worked together? Imagine wandering the 1,200 acres and finding the perfect picnic spot right in the heart of the Greater Manchester conurbation. But while dreaming of pastoral beauties we also must remember the great service the industry of Trafford Park which replaced the deer did in the struggle against Nazi Germany in World War II. We should also remember the service it has done in providing employment for thousands of people from the region – a role it still delivers. Manchester United would also have had to have find some other home when it moved from Bank Street in east Manchester in 1910. It was just after the Second World War when Trafford Hall finally disappeared, demolished after bomb damage. For a while in the first years of the twentieth century it had been a club house for Manchester Golf Club, but industry, smoke and pollution had forced the golfers to Middleton, north of the city. Hints of the pre-industrial Trafford Park survive along with the long residency of the de Trafford family. 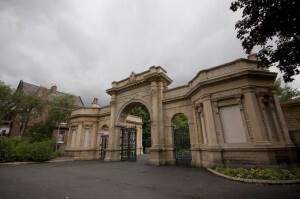 The entrance to modest Gorse Hall Park on Chester Road in Stretford incorporates the very grand lodges of Trafford Hall and Park which formerly stood where Harry Ramsdens presently squats close to Old Trafford football stadium. All Saints Church, close to Barton Bridge at the west end of the park and close to the Trafford Centre, is one of the region’s finest churches. It was designed by E.W. Pugin (who also designed Gorton Monastery). St Ann’s, Streford, was another gift of the de Traffords, again by Pugin. All Saints, though, was his finest work and contains tombs and a chapel of the family. It is a Roman Catholic church because the de Traffords were one of the few ancient families to stick by the ‘old faith’ during the Reformation despite the danger this presented. Meanwhile, the boating lake of the park is now much smaller but survives as part of the Trafford Park Ecology Park. Finally, the residential streets of Old Trafford, Seymour Grove, Henrietta Street, Northumberland Road, Stanley Road, Humphrey Road and so on, bear names tied to the de Traffords, including favourite first names, Humphrey and Henrietta, and those of other noble families with whom they were associated. This story comes from research used in a book by Jonathon Schofield ’Lost and Imagined Manchester’.